Yesterday I decided to pick cucumbers, thinking I might get a few. 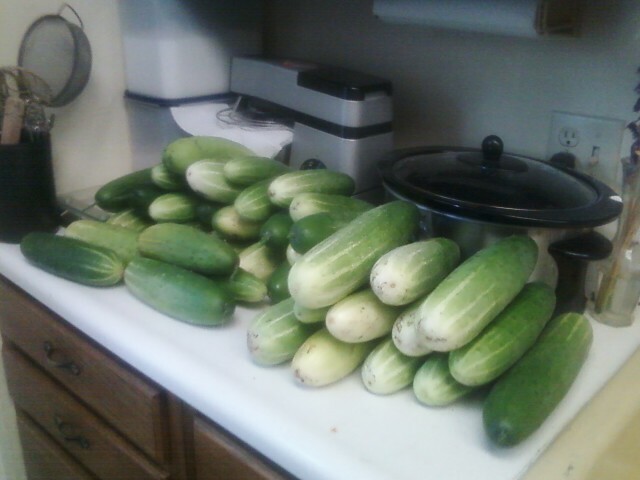 By the time I decided to take a break, I had 40 cukes. Most of them about medium size, but a few were huge. I wasn't prepared to start canning, but it looks like I don't have much choice. I did get the numbers down to 32 after giving half a dozen to a friend whose vines died off then having two with lunch today. I might send the kids out to see if they can find any more. Hubby is at the store right now buying lids for the 24 quart jars we already have plus another two dozen jars in preparation of what is to come. I think today we'll make up this batch as refrigerator pickles since we've run out of pickles that we jarred last year. We need a quick pickle fix. Last year, our first year canning, we used a recipe we found on the internet. This year we have hubby's grandmother's recipe to try. We're looking forward to eating them in a few days. I'll make sure to blog about the final result!